The Extraordinary Chambers in the Courts of Cam­bodia (ECCC) stands as a shining example of all that is wrong with the U.N.’s post Cold War paradigm of therapeutic legalism. A credible trial for Khmer Rouge leaders Khieu Samphan, Ieng Sary, Nuon Chea and Ieng Thirith would have made it possible to overlook the Cambo­dian mixed tribunal’s corruption and over­all inefficiency. Due to Ieng Sary’s death on Thursday, this is no longer a possibility. Not only has the ECCC lost two of its most important defendants due to old age, it is unlikely that the remaining two will live to hear their verdicts. Sentenced to death in absentia by both Vietnamese (1979) and Khmer Rouge (1996) show trials, Ieng Sary was the Khmer Rouge’s greatest political chameleon. Al­though he claimed no knowledge of the widespread atrocities committed by his followers, U.N. investigators Steve Heder, Craig Etcheson, Rich Arant and Steve Spargo meticulously constructed a paper trail that proves otherwise. “Pol Pot is guilty, but just as guilty, like Himmler, is Ieng Sary,” said Cambodia’s late King, Norodom Sihanouk. “He is the big guilty man number two after Pol Pot.” During the three years, ten months and twenty days (1975 to 1979) his regime held power, Sary served as Cambodia’s foreign minister. His signature atrocity began as a documentary film made with the help of the Chinese advisers. 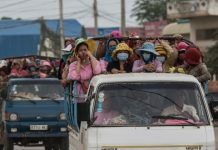 The movie featured shots of the idyllic Cambodian countryside and was shown to Cambodian expatriates in Paris and other European cities in an effort to lure them home to join the revolution. By 1980, with the U.N. the U.S. now firmly behind him, Ieng Sary claimed to be an anti-communist freedom fighter. 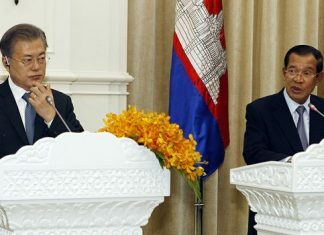 He explained to one reporter that the Khmer Rouge “set our hopes on the Reagan government, that it will implement its declaration to act uncompromisingly with regard to the Soviet Union and only negotiate from a position of strength. 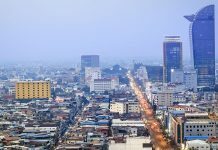 That would help us a lot.” By the 1990s, Ieng Sary was a full-fledged capitalist and had grown rich from the timber and gem trades. He turned on Pol Pot and surrendered to Cambodian Prime Minister Hun Sen in 1996. This internal division led to the collapse of the Khmer Rouge as a political movement. Given that he appeared to be the beneficiary of an amnesty, it is a small miracle that Sary ever saw the inside of a courtroom. However, since the ECCC issued their first indictment, they have moved at a snail’s pace. Although the U.N. has already spent more than $200 million on Cambodia’s mixed tribunal, they have only convicted one man—Tuol Sleng death camp commandant Brother Duch. This blood stained butcher was a garden-variety war criminal whose case was so simple that it should have taken less than a month. Because the U.N. set an overly ambitious agenda for the ECCC, they wasted precious time in an attempt to deliver legal unquantifiables like “truth,” “reconciliation,” and “healing.” Now the clock has run out. The Cambodian court’s failure to convict one of the most significant war criminals since Herman Goering took the stand at Nuremberg raises an important question: Are the U.N.’s overcomplicated and overpriced trials worth the money, time and trouble if, like Slobodan Milosevic’s case, they cannot complete trials within the defendants’ lifetimes? It is fitting that the wheels are falling off of the ECCC and U.S. trials at Guantanomo Bay at roughly the same time. Although these two sets of trials stand on opposite ends of the political spectrum, they represent everything that is wrong with international criminal law in the 21st century. Peter Maguire is the author of “Facing Death in Cambodia” and “Law and War: International Law and American History.” He has taught law and the theory of war at Columbia University and Bard College in the U.S.